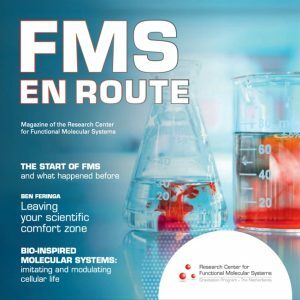 FMS staff members Sander Wezenberg and Ben Feringa (both RUG) published their recent research results in Nature Communications. The article reports on a supramolecularly directed rotary motion in a photoresponsive receptor. The motor was designed such that the rotation is directed by a chiral guest molecule that is able to non-covalently bind to a light-responsive receptor. The rotary direction is governed by the guest chirality and thus can be selected at will and thereby offers unique control of the directional rotation.